There is a story that says that if you live where people are the salt of the earth, in the middle of summer, you better keep your doors locked. Not because these salt-of-the-earth neighbors are going to rob you, but because they are likely to drop off a big bunch of zucchini on the seat of your car or in your entryway, making eating it all it your problem. I would like to think that my neighbors are the salt of the earth, but as of yet I haven't had any wayward zucchini harvests appearing in or on any of my property. (I also haven't been abandoning zucchini on anyone else's doorstep, either, though. The one time I tried to grow it bugs ate the teeny little seedlings down to nothing overnight.). However, it seems that even the farmers need to offload zucchini in great quantities. My Abundant Harvest box has been... shall we say... generous in its helpings of zucchini and summer squash for quite a few weeks now. It is,,, shall we say... a challenge to keep up with it all. 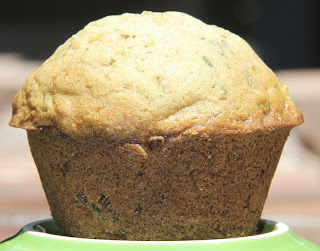 My kids, who aren't the greatest veggie eaters, won't eat zucchini in any form except zucchini bread and zucchini muffins. (I'm not exaggerating. They even turned their noses up at chocolate chips cookies. Okay, Zucchini Chocolate Chip cookies, but those things are really really good and still they won't eat them). 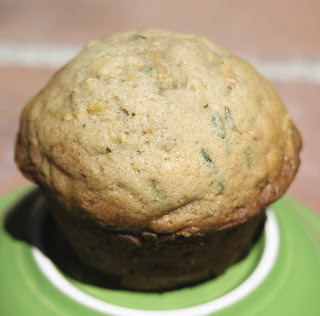 So, zucchini muffins it is. Except how many time can I make them without losing my mind? So I put a little twist on the muffins this week... lemon. Lemon and zucchini go great together, and that is especially true in muffins. The lemon zest in these gives them a whole new life, and really sets them apart from ordinary zucchini muffins. This is most likely going to be the only way I make them from now on! I really like the lemon addition, so in my opinion, more is better. I used the zest from 1 lemon the first time I made these, and doubled it the send time. It was doubly delicious! Combine the flour, baking soda, and salt and set aside. Using a mixer, beat the eggs and sugar together. Add the vanilla, lemon zest, and butter. Add the zucchini and then slowly add the dry ingredients until combined. Grease your muffin cups with a little bit of butter. Fill the muffin cups pretty much all the way (these muffins grow tall nicely, and don't really spill over the pan... so it's okay to fill the cups all the way). Bake for 25-30 minutes, or until nice and tall and golden brown. A toothpick should come out clean. Let them sit in the muffin pans for a few minutes and then take them out to cool completely. The original recipe (from Stephanie's Kitchen) said that it makes 12 muffins, but I got 15 out of it, and they were still nice and tall and full.